Choose from two material opitons that are durable and last. At Bannerbuzz.com, we have designed a wide range of highly appealing, fun, and playful firepit signs that can add allure to your space. With our extensive customization options, you can design a sign of your choice. From choosing a custom size to selecting a fun quote or image, you have complete freedom over the design process. Whether you need a residential firepit sign or one for commercial use, we have it all. 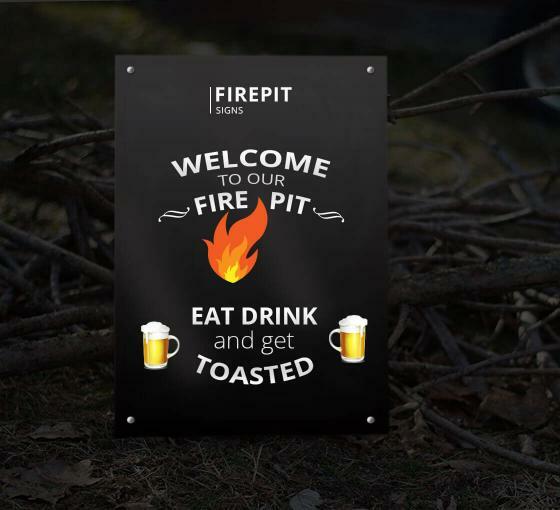 Our Welcome to Our Firepit signs are made using durable materials that last a long time. And when it comes to printing, we only make use of cutting edge printing technology and ink that stays intact even in the outdoors. The ink we use is UV protective, which means that it will not fade in the outdoors, making your firepit look great all day every day. If you have special design requests for your Welcome to Our Firepit sign, feel free to get in touch with our creative team. We will note down your requirements and design a sign that is not only fascinating, but very high quality.